Remote Application Center is a simple program that permits controlling access to applications installed on Terminal Server. Applications are published on the server and user can run it directly from shortcut on the client side. Compatible with Windows 2000 server, Windows 2003 and Windows 2008 with Remote Desktop Services. Last but not least, the GUI can be translated to any language of your choice. - Published Application Database Centralized. With Windows 2008 Server, Remote Desktop Services (RDS) must be enabled (Terminal Services in previous versions). 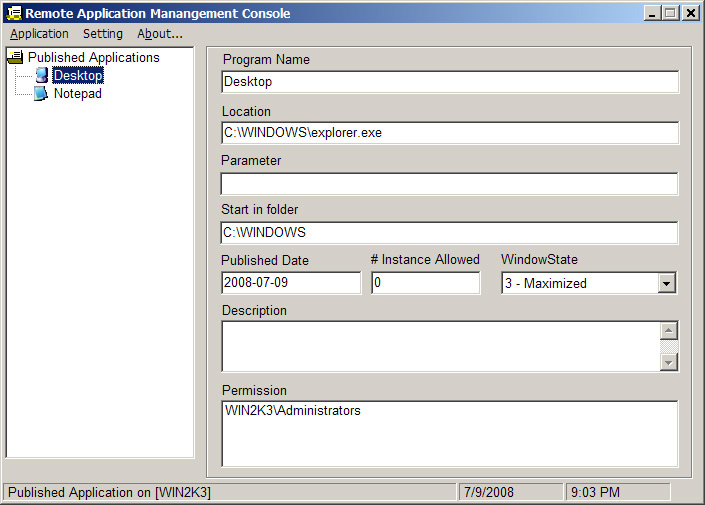 It's not compatible with Remote Desktop Connection for Administration on Windows 2008.